Taste test: These are really good, very flavorful plain potato chips. 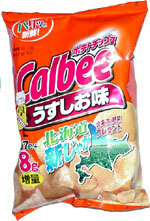 Not being able to read Japanese, I don't know if the bag says that they're made from Russet potatoes, but that's what they taste like. Quite a good chip. The bag had been shipped from Japan to Massachusetts by the time I bought it, but the chips were still large and unbroken, and the bag was just about full. Smell test: Very potatoey, sort of like Russet potatoes.